Recently DC released the new animated movie, Justice League: Crisis on Two Earths. I thoroughly enjoyed the film and was happy to find many bonus features on the Blu-Ray disc. One bonus feature was a documentary where DC writers and editors spoke about the changing of the DC universe after the events of 9/11 occurred. DC aimed to start asking questions of morality that were no longer cut and dry. What defines a hero in today's society and how does a hero act and make decisions? These questions roll throughout DC's events starting with Identity Crisis. The writers in the documentary started talking about Identity Crisis (which I had just read) and then began talking about Infinite Crisis. The later I had not yet read yet and was forced to turn the documentary off so the story would not be ruined for me. 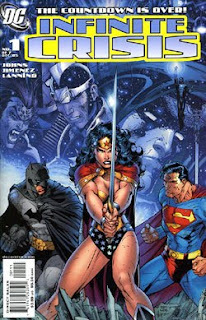 So here I am today with the comic of the day, Infinite Crisis #1. The issue sets up the plot of the 7 part series which seems to rotate around a small group of other Earth characters (including 2 Supermen and a Luther) trying to make Earth a better place by replacing it. The story starts off with DC's trinity of Wonder Woman, Batman and Superman investigating the destruction of a space station base which was destroyed by someone or some thing. After a brief battle with Mongul (which seemed random) the three heroes have a fight over morality and go their separate ways. I have always been a Marvel kid, but I am really curious when it comes to these huge DC events. I think Geoff Johns (the Infinite Crisis writer) said it best when he said that he like DC because it was more fantastic and out there compared to the more reality grounded Marvel. I never heard a person say they liked DC for that reason. Usually someone says they like Marvel because of the way it grounds it's self in the real world. But some people, like Johns, read comics for the totally spectacular and that is why they choose DC. For the first time I think I can respect a DC reader for that reason. No wonder DC just put Johns in charge of overall story telling. The man can make a point, and from what I've read so far, a damn good comic book.